Wish you could reduce your heating costs? Well you can! We're expert plumbers who can help you with a condensing boiler installation that can reduce your fuel bills along with helping the environment. How? Condensing boilers are designed for increased efficiency thus using less energy. 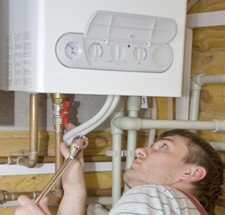 Call for a free estimate and further details of how a new boiler could help save you money today. We can give you a free telephone estimate for the plumbing and installation so that you know exactly what to expect before we undertake the work. We're Gas Safe registered plumbers so you can be sure we'll carry out your new boiler installation and any gas plumbing work safely and legally for your peace of mind. Call now on 0117 345 9036 with your requirements and we can discuss the options open to you. We will never ask you to pay up until you confirm that you are satisfied with the work we've done! Is your bathroom looking a little tired? Then you'll need to contact us and we'll come out and give you a free estimate.